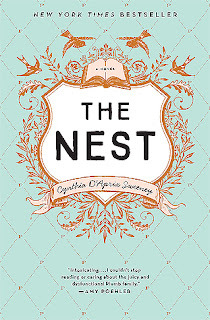 Cynthia D'Aprix Sweeney's debut novel "The Nest" is exactly the type of novel I like for a summer read. Engaging, but not so engrossing that I can't leave it for my millions of summer plans (or bar prep this summer); interesting characters who are still familiar enough that they don't merit close investigation or consuming reflection; and above all, enjoyable & stimulating without weighing me down with intellectual insights. I recognize that could very easily be read as a list of backhanded compliments, but I really did enjoy this novel. The premise: four siblings are awaiting the day when they receive an inheritance from their father, which they affectionately refer to as the nest. One of the siblings is involved in a horrific car accident months before they are all set to receive the inheritance, and their mother decides to use the funds to pay off the expenses and hush money the accident requires. The other siblings are miffed, as each had their own plans for their inheritance, and must now figure out how to navigate their rich people problems without the tidy sum of money they had come to expect. None of the siblings' problems are life or death, and they are all of their own making - living beyond their means, taking out loans without telling their partners, failing to sustain a livable income or honor contractual obligations. They are nonetheless serious, and the types of things that will reasonably weigh on their minds as they figure out what to do in the wake of their brother's accident and the ransacking of their trust fund. The four siblings were each unique, and I particularly appreciated Sweeney's definition of each in part by how they relate to the others. Siblings as close or as intertwined as these do not develop their identities in isolation, and Sweeney captures that perfectly. She also does a great job capturing the wealthy, or want-to-be wealthy depending on the character, New York City setting. The novel lacks the grit or stakes of a novel dealing with true life-or-death problems, but still remains compelling and interesting for its accurate depiction of the problems of those who probably consider themselves upper middle class, but whom the rest of the country would likely consider upper class. Verdict: Affirmed. If you're looking for a light beach or summer read with a bit more heft than your average chick lit, check this one out. It's great on audio if you're looking for a dog-walking read as well. 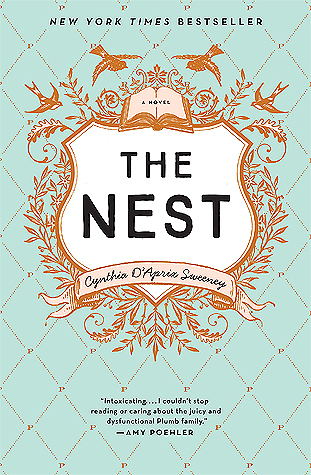 "The Nest" by Cynthia D'Aprix Sweeney, published March 22, 2016 by Ecco. Audio narration by Mia Barron, published March 22, 2016 by HarperAudio.